Chicago pizza is deep dish style pizza that was developed in Chicago. It has a buttery crust, as opposed the thin, crispy crust here in California or in Italia. The crust acts as a bowl for the greater abundance of cheese and chunky tomato sauce. Most pizzerias in Chicago also serve a thin crust pizza, but deep dish is their claim to fame. The Chicago style deep dish pizza was invented at Pizzeria Uno in 1943 by their founder, Ike Sewell. The Chicago Daily News disputes this with a blurb about Rudy Malnati, Uno’s original pizza chef, who developed the recipe. This pizza ventures far from the origins of pizza, wherever you think it was invented. The first pizza I had in the 1970s in Rome was built on a crust that felt, looked, and tasted like a layer of bread. There are no delicate toppings, just mostly cheese, chunky tomato sauce, and spicy Italian sausage. The thick pizza dough is made with olive oil and corn meal, the parbaked in a deep round pan. The pan is heavily oiled with olive oil to create a fried effect on the outside of the crust. The the crust is covered with cheese, primarily mozzarella, and meats in a patty or solid layer. At this point, Italian sausage, onions, mushrooms, and bell peppers can be added. The sauce is added last. Sewell opened another pizzeria, Due, as a companion to Uno in 1955. Original Gino’s Pizzeria opened on Rush Street (read that singles bar and meat markets) a year before. In 1966, Gino’s East opened. The Lou Malnati’s was opened by one of Rudy Malnati’s sons. 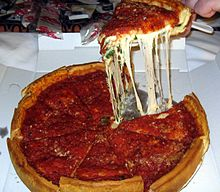 Then in the 1970s, Nancy’s Pizza and Giordano’s Pizza experimented with deep dish pizza and created the stuffed pizza. By definition, a stuffed pizza contains more toppings, then covered with a layer of pizza dough that is pressed to the bottom. A hole is cut, similar to a baked fruit pie, to allow air and steam to escape. Then more sauce is ladled over the crust, then baked. Giordano’s, somebody had to be third. Once you have settled on a pizzeria, the discussion moves rather heatedly to Chicago versus New York pizza. Americans spent nearly $40 billion on pizza last year. And get this, pizza chains account for only 40% of that total. This is still a business dominated by mom and pop pizzerias. The deep dish and stuffed pizza is very filling. It is hard to eat more than one helping. For my taste, I love a crispy thin crust, with the right amount of cheese and sauce. Then I like it topped with sweet Italian sausage, and maybe some semi-spicy peppers. In fact, they make one just like that at Serious Pie in Seattle! But, when in Chicago, do as Chicago. The basic premise of midwestern food preparation and eating is quantity. This is definitely not California cuisine or California pizza. These pies are enormous. And I cannot imagine having one delivered, as it would require heavy equipment and a crane. Not only do they have broad shoulders here, they have robust meals, with lots of steaks and ribs. Look at any list of top Chicago restaurants, and the steak places are always dominating the top five. But much like New York, San Francisco, and St. Louis, the Italian neighborhood is rich and vibrant, with food. This is a bottled beer and red wine town. No chardonnay sipping allowed here! Italians first came to Chicago in the 1850s. Little Italy, as it formed, was inhabited by Italian immigrants, brought to prominence in the 1920s by the Mafia. Little Italy is bordered on the north by the Eisenhower Expressway, by the Kennedy Expressway on the east, Roosevelt Road on the south, and Polk Street on the west. The University of Illinois at Chicago is a big part of Little Italy here. For us local Bay Area residents, there is a statue of Joltin’ Joe DiMaggio in the Piazza DiMaggio here. Taylor Street is the main drag through Little Italy, with well-known eateries like Rosebud’s, Pompeii, Tuscany, and Francesca’s. So, forget the thin crust of the East and Left Coasts. Be prepared to dig into a pizza that is more like lasagna. Wash it down with some red wine or beer. Be a Chicagoan for at least one meal. I am sure your President has a fondness for Chicago pizza. As far as my own escapades here in Chi-town, I had dinner last night at Big Bowl, and breakfast this morning at Eggsperience. I was walking around and felt sorry for a homeless fellow, so I took him in there. I have Keri, the hostess $20 to feed him, and went on my way to Millennium Park. 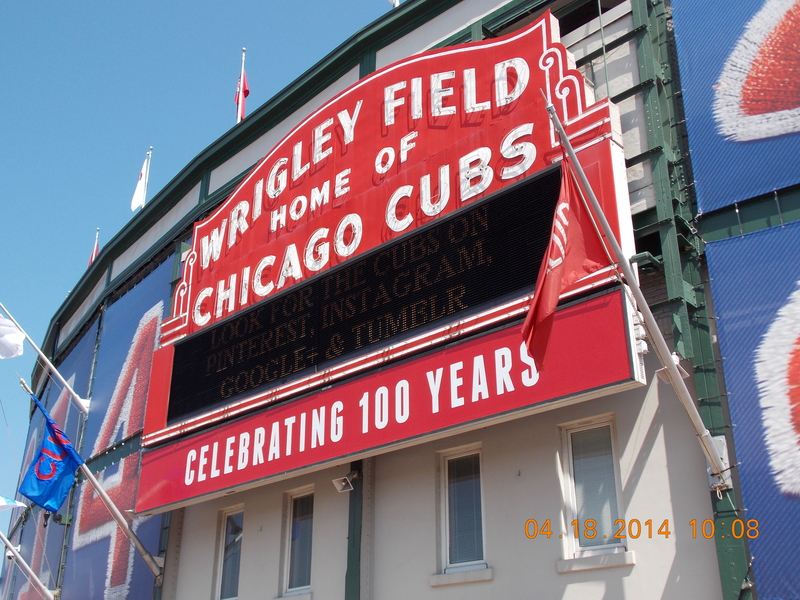 I did manage to get out to Wrigley Field and see the Cubs play the Cincinnati Reds. Tomorrow, I leave for home. Short trip, not enough time, my usual story.